InFocus, the US-based tech brand, has added yet another smartphone to its portfolio with the launch of Bingo 50. Continuing with core proposition of the Bingo series, InFocus Bingo 50 is aimed for selfie lovers, who want to capture their best side with the 8MP front camera on the device. The front camera features a Samsung S5K3H7 camera module with back-side illumination for better low-light performance and almost zero shutter lag. The InFocus Bingo 50 is powered by 1.3GHz quad-core MediaTek MT6735 processor and it comes with 3GB of RAM. The phone packs 16GB of internal storage that can be expanded up to 64GB via a microSD card. As far as the cameras are concerned, the InFocus Bingo 50 packs a 8-megapixel primary camera on the rear and a 8-megapixel front shooter for selfies. The InFocus Bingo 50 runs Android 6.0 and is powered by a 2500mAh non removable battery. It measures 150.96 x 71.45 x 10.60 (height x width x thickness) and weighs 152.00 grams. 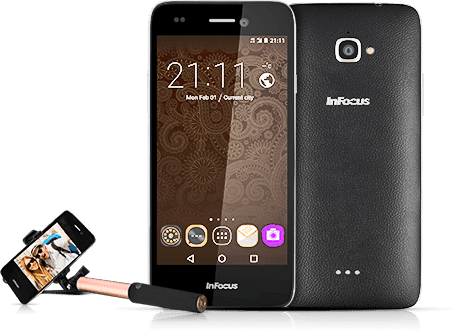 The InFocus Bingo 50 is a dual SIM (GSM and GSM) smartphone that accepts two Micro-SIM. Connectivity options include Wi-Fi, GPS, Bluetooth, FM, 3G, 4G. Sensors on the phone include Proximity sensor, Ambient light sensor, Accelerometer.